Just 5 km from Nadi International Airport, the hotel is 8 km from downtown Nadi and lies within 15 km of Denarau Island and its marina. Close to airport and quiet. Great facilities and friendly staff. We moved from another resort to the Radisson and I am so glad we did. The staff are simply amazing, lots of activities for the kids to do. Free manager cocktails and surprise fruit platter from the management. I was surprised that all the members of staff knew me by name! What a personal service. Rooms were clean and spacious, the food is just fresh and fantastic, the cocktails were great. Complimentary late check out, music, mini-bar etc We used the babysitting service and Rosie was amazing. We were sad to leave and back home my son keeps saying 'I miss our holiday home'. 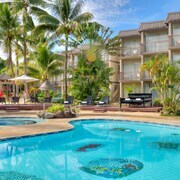 We will be back to Fiji and straight to the Radisson. For parents travelling with Kids don't bother going anywhere else as we tried another '5 star resort before moving to the Radisson. Thank you for a lovely holiday. Where to find Nadi hotels near an airport? Where can I find hotels in Nadi that are near tourist attractions? 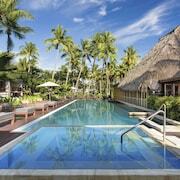 There are plenty of options for vacationers searching for a hotel in or near Nadi. Approximately 46 accommodations can be found within a 0.1-kilometre (0.06-mile) radius from Nadi's city center. A good option if you would like to stay close to the middle of Nadi, is the Nadi Downtown Hotel. Students, families and those keeping an eye on their dollars will find some nice Nadi lodging options that won't that won't make the bank manager's jaw drop. The Novotel Nadi is 6 kilometres (4 miles) from downtown, while the Tokatoka Resort Hotel is 7 kilometres (4 miles) away. 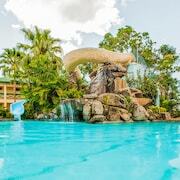 More options in the cheaper range are the Hans Travel Inn and the Best Western Grand West's Villas. 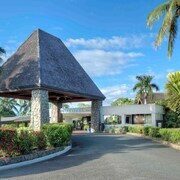 30 kilometres (18 miles) from the main part of Nadi, is the Likuliku Lagoon Resort. The Malolo Island Resort is located 30 kilometres (18 miles) away. 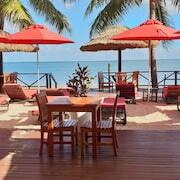 Some other hotels are the Sheraton Denarau Villas and the Lomani Island Resort. Why not spend some time visiting Natadola Beach and Natadola Bay Championship Golf Course, in Natadola, 35 kilometres (22 miles) to the south of Nadi. If you'd like to spend a few nights in Natadola, check out the InterContinental Fiji Golf Resort & Spa and Natadola Beach Resort. 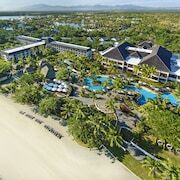 Or, you could stay in Pacific Harbour, 85 kilometres (53 miles) to the southeast of Nadi, where you can pick from the The Pearl South Pacific Resort and Uprising Beach Resort. The Pearl South Pacific Championship Golf Course and Arts Village are a couple of the more popular sites to see should you visit Pacific Harbour. While you are here why not spend some time hanging out with Fiji sports fans at a local match. Denarau Golf and Racquet Club is 6 kilometres (4 miles) to the northwest of Nadi. Those wanting to find a room or apartment close to the stadium can take their choice from the Hilton Fiji Beach Resort and Spa or the Sheraton Fiji Resort. Nadi International Airport is a practical airport, and is 7 kilometres (4 miles) away from Nadi. 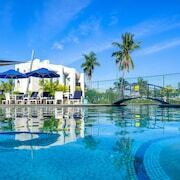 Expedia-listed hotels close to Nadi International Airport include Hibiscus Apartments Fiji and Trans International Hotel. What are the most popular Nadi hotels? Are there hotels in other cities near Nadi? What other types of accommodations are available in Nadi? Explore Nadi with Expedia.ca’s Travel Guides to find the best flights, cars, holiday packages and more!